What Chest Rigs are and How They Benefit You? Chest rigs were first used in First World War and became popular with military and civilians to carry water, weapons and important tools. Nowadays, there are more and more types of chest rigs with impressive innovations available in the market. Choosing the best chest rig which is comfortable and convenient may be a challenging task. It is why it’s important to familiarize yourself with the different types of chest rigs, their different functions, and primary action so that you can make an informed decision for the long run. This article will, therefore, give you the insight on different types of chest rigs, tips to find the best chest rig as well as review top five most favorite chest rigs on the market right now. Chest rigs can is, in fact, the vests across the body with multiple pockets with different size. They allow users to carry a wide range of items based on their need without any effort so that ensuring the fast and proper movements of users. – Breathability: chest rigs have the same design as the vest thus they are lightweight, and breathable to be worn in hot weather. – Compatibility: chest rigs can easily route with body armors and backpacks. – Mounted operations: chest rigs allow you to sit at your seat comfortably and utilize airbags with no problems. Chest rigs were first used to help soldiers carry swords, daggers, and necessary weapons; while at the same time, it acted as the shield to somehow protect soldiers on the battlefield. During two World Wars, chest rigs became more and more popular in Americans, Soviets, Vietnamese and Chinese soldiers to carry guns and gunpowder. In the past, the most common material of chest rig is cotton. As chest rigs are more commonly used in today military, medical, photography, the manufacturers have introduced different materials with additional attachments which allow users have more add-ons. 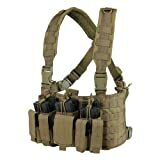 Chest rigs and plate carriers have movable pockets, and also you can control carrying capacity for a specific need. In contrast, pockets on tactical vests are all fixed; prevent you from relocating and removing pockets. Materials made of both plate carriers and tactical vests are nylon which will increase body temperature and make it quite uncomfortable to moving in hot climates. Chest rigs, on the other hand, are made of different materials and gradually improve their design to make it easier and more comfortable to wear for a long time. A tactical vest is cheapest among the list; chest rig is right behind, leaving plate carriers the most expensive item. It can be explained by the long lifetime and the additional armor of plate carriers. The size of chest rigs should have some pouches with various size of each pouch to carry different items. However, the chest rigs should be too big or too small for your size but can resizable by controlling the secure belt. The best chest rigs can carry at least 12 mags with from 4-6 open top M4 pouches and also one pouch for First Aid Kid. To ensure the security of mags and other important personal items, the pouches should have elastic designed and non-slip coating. Also, the material of the pouches should be lightweight and high-quality nylon to ensure comfort in use and durability. These are the two most important factors of a chest rig. Chest rigs should help to aid your safety, especially on the battlefield or dangerous area. Many chest rigs have already provided optional armor for a soldier. Moreover, you must choose the best chest rig from reputed brands and reasonable price with good warranty service to assure long useful life. As well as another military vest, chest rig when carrying additional items are quite heavy. Therefore, the chest rig itself should be lightweight so that you can move easily. Extra cross-back shoulder straps can be the perfect solution as they reduce the pressure on your back and use for a long time without the risk of back pain. 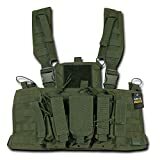 Chest rigs, in fact, are more breathable than other military vests to wear in hot weather but to rest assure, you should find the chest rigs with additional back mesh. Condor is a reputed brand, and Condor Tactical Recon can meet almost all your needs. 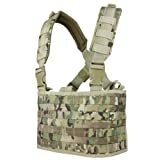 This chest rig can help to carry up to six magazines held tight to the chest, which prevents the risk of sagging and always ready to be drawn. The shoulder straps are padded and have a mesh to ensure the highest comfort and breathability. The total size of pouches reaches 8×20.5 inches with additional 7×10 inches of the internal document pouches. Although the mag carriers are fixed, they are in the perfect position to quickly pull out within seconds. It’s undeniable that Condor Tactical Recon is among the best chest rigs on the market right now. 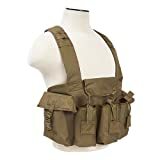 This affordable chest rig is light weight but and able to carry up to six magazines with other three double AK magazine pouches. The front pouches have a capacity of six magazines while the two-sided pouches can fit two more AK magazines. Made of highly durable nylon fabric, VISM offers the best comfort when using on the battlefield. Moreover, the Padded cross-back shoulder strap will help to support the weight of the chest rig so that you will feel it easier to carry in the long distance without the risk of back pain. OPS chest rig offers plenty of pouches including four Kangaroo type magazine sleeves. Front pouches and sided pouches are utilized with Velcro flaps and quick release buckles for rapid response situations. It’s safe to say that OPS is the best chest rig which offers great value and is suitable for different purposes like hunting, paintball, and airsoft. Padded cross-back shoulder strap with D-ring and open at the back to prevent from sweating which is a common case of many chest rigs. Moreover, this design helps to reduce pressure so that you can carry your items without burden. Made of high quality 600 denier polyester, Lancer Tactical CA-307 Modular chest rig ensures durability and highest comfort in use for users. MOLLE attachments are on the front, back, and side to provide needed spaces for a full tactical setup. Three front pockets can carry up to one 30 round mags each and go along by an integrated pouch. The two side pockets can store two 40 mags each which is quite impressive compared to another chest rig. Although the chest rig is design covering the back, the back panel actually can be removed to serve for a different purpose. With reasonable price, Rapdom Tactical Molle chest rig is made of 100% nylon. The vest design only covers haft of user’s chest with adjustable padded cross shoulder straps so that it can suit for different body size and also ensure to be breathable to use for a long time. Thanks to no zipper and quick release buckles, Random chest rug is perfect to use on the battlefield or in the training which needs urgent actions. Moreover, the three carbine magazine pouches can hold up to two mags each. It’s hard to find another chest rig to beat for that price. The best chest rig can ensure you done your job well regardless whether you use it in military, medicine or photography. Hopefully, after looking through our reviews, you will select the suitable chest rig to make your job done faster and more efficient.